You may be excited that, in a few lines, you are getting a look at the Florida Gators 2012 spring practice depth chart. Don’t be. As he explained one year ago, head coach Will Muschamp does not put a lot of stock in the spring’s first depth chart, referring to it in 2011 as not worth the paper it was printed on. In other words, it is just a starting-off point for 2012 and plenty can change between now and the end of spring, the start of summer, the beginning of fall or when the season starts. Nevertheless, below is the depth chart as it was presented on March 13. Florida omitted players who are injured or limited and not participating in spring practice. A list of those players can be found at the end along with some additional explanations. – TE A.C. Leonard remains indefinitely suspended from the team for his recent arrest for misdemeanor domestic battery. He would fit in at the first or second slot at his position. 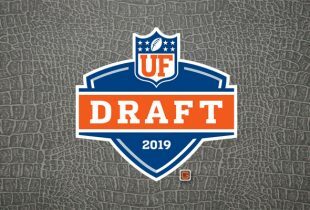 – Wilson was granted a sixth year of eligibility by the NCAA, a big win for the Gators and their lack of depth and experience on the offensive line. – Freshman D.J. Humphries, expected to make an impact at offensive tackle, is not yet on the two-deep depth chart likely due to an off-the-field reason like weight or conditioning. Showers staying in the secondary? I figured he’d be a candidate to move to RB. I also really like Hines at RB, if he gets a fair shot there, I think that could be a sleeper move, but assume it’s not legit. Looks like we have some experience on pit team for next year. Surprised to see Pittman already ahead of Story? Brown has been injured pretty much his entire career. Was really productive in the portion of the season that he played. Pretty sure they’ll experiment with Burton and/or Joyer at tailback some this spring. Glad to see the ultra-talented Luchiez Purifoy at the top at one corner, but am concerned about Roberson if he is still limited. The shocker is Alajajian at nose tackle. Interesting how Nixon went from the first true freshman to ever start at left tackle to 2nd string 3 years later. Thanks Adam, I believe you are the 1st to post this info. Glad to see RB position with such big players. We may be able to move the ball now that we have some larger people in the backfield. I am eager to see if the wide receivers step up and how Story plays a role in the offense. The defense is going to be excellent and I have no worries about them. Jeff and Jacoby better watch out because Tyler Murphy was a great high school dual threat and can move his feet. He may come out of the gates the starter if Driskel and Brisset slip. Also Skyler Mornhinwig is going to be Pease’s favorite considering he was looking at film and recruited him.